With a screenplay written by Sylvester Stallone and James Cameron, the 1985 classic, “Rambo: First Blood Part II” is a force to be reckoned with. John Rambo is back, following the success of 1982’s smash-hit, “First Blood,” and he is still pissed off. As a follow up to their fantastic “First Blood” print by Gabz. Great Matter Art is back for more John Rambo! Tomorrow, Tuesday, April 21st, Grey Matter Art will be releasing an officially licensed print by Anthony Petrie for the action film that gave us the great line, ” To survive a war, you gotta become war” – John Rambo. These prints will go on sale at 1 pm EST on Grey Matter Art’s OFFICIAL WEBSITE. Be sure to head on over to Anthony’s OFFICIAL WEBSITE to see more of his sensational work. 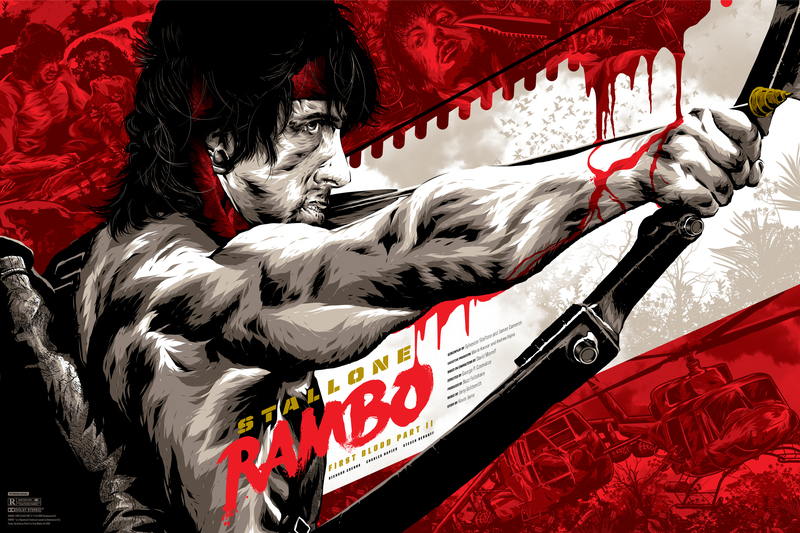 This entry was posted in Art, Grey Matter Art, Movies, Posters and tagged Anthony Petrie, First Blood, Grey Matter Art, James Cameron, John Rambo, Rambo, Rambo: First Blood Part II, Sylvester Stallone. Bookmark the permalink.